If you’re looking to find the best credit card, chances are you’ve discovered that there are hundreds of different options available in the UK. Each company has a range of different features to try and get your business, from cashback to introductory interest-free periods. It’s worth spending a bit of time figuring out what’s important to you before making your decision. What you definitely want to know, however, is what thousands of people across the UK think of the decision they made. Luckily, that’s where our Smart Money People reviewers come in – they’ve told us what they think about the products on the market right now, and we’ve taken an average of their ratings in order to see who comes out on top. It’s clear looking at the chart that, with a near-perfect overall score of 4.89/5, Santander’s 123 Credit Card is the best credit card according to our reviewers: it comes top in all four of our categories, closely followed by Halifax’s Clarity Credit Card for everything except customer service (the American Express Charge Card is second for customer service). The Halifax Purchase Credit Card is in 10th place with an overall score of 3.78/5. The chart comes from the insight we’ve had from the thousands of reviewers who tell us what they think about their financial products – good or bad! In this instance, our best credit card chart highlights the top 10 credit cards and ranks them in order of most recommended, value for money, customer service, and how each reviewer has rated their overall credit card experience (out of 5). What makes a good credit card experience? By taking a look through our five star reviews, it’s easy to see what customers value more than anything else when it comes to their credit cards: good customer service, added features, and low interest rates. 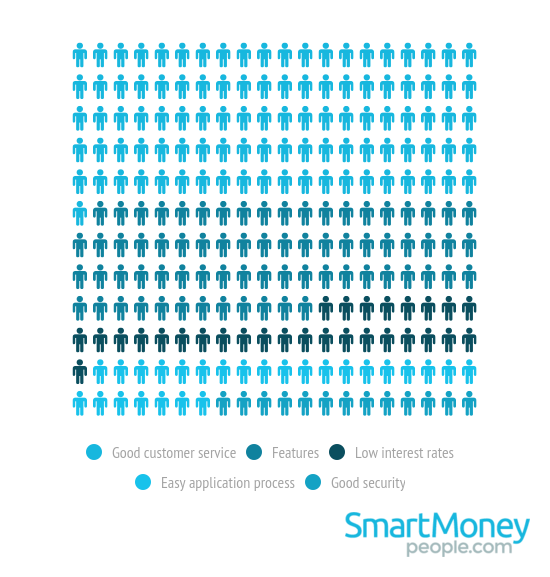 Above you can see what our Smart Money People reviewers value most about their credit cards, and we've highlighted a few reviews below. The fact that good customer service is rated so highly by consumers shouldn’t come as too much of a surprise. For our reviewers, being able to speak to helpful and friendly staff is incredibly important. However good customer service can be much more than that: making sure customers understand the terms and conditions attached to their credit card is important, as is taking the time to clearly explain about interest rates and charges. Credit card fraud is big business: in 2014 alone UK banks wrote off £479 million of fraudulent debt. Security experts recommend keeping an eye on your statements and checking them against your purchases regularly, and you should contact your card provider the second you notice anything unusual. What makes a bad credit card experience? Sadly not all experiences are as positive as the ones we’ve explored above. High interest rates, poor customer service, and unfortunate timing (one reviewer received a credit card statement by text on Christmas Day) have all been cited as reasons for leaving a negative review. High interest rates are another contentious issue among Smart Money People. This review of the Capital One Classic Credit Card highlights a catch 22 problem with the company’s rates. Does a new Capital One customer immediately become a Capital One complaint? So which credit card is the best? So there you have it: the Santander 123 Credit Card is the best credit card in the UK according to our reviewers. Second place in all categories except customer service is Halifax’s Clarity Credit Card. It’s worth bearing in mind the pros and cons of credit cards when thinking about your next credit card. We’ll be reviewing this data in a few months to see if there are any changes. You can influence how this chart looks in future by writing a review, and if you’re in the market for a new card don’t forget to check out our full comparison of credit card providers. 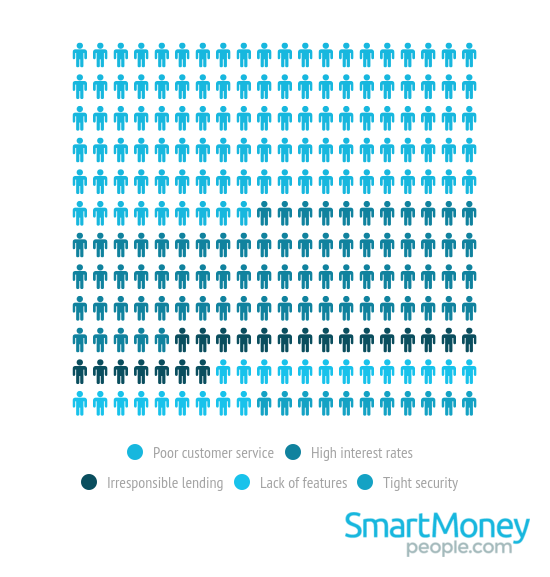 Want to know what our Smart Money People are thinking about current accounts? Take a look at the best current accounts! Are you a spender or a saver? Complete the quiz below and share your results with us.